Labour groups opposed to Argentine President Cristina Fernandez say the second general strike of the year has been a success. The stoppage began at midday (15:00 GMT) on Wednesday and disrupted life in the capital, Buenos Aires. Many stayed at home as the country's cafes, restaurants, rail, air traffic and ports were affected. Strikers demanded increased wages and lower taxes in response to higher living costs. The latest stoppage was called by Hugo Moyano and Luis Barrionuevo, who belong to an anti-government faction of the country's largest and most powerful union, the General Confederation of Labour (CGT). 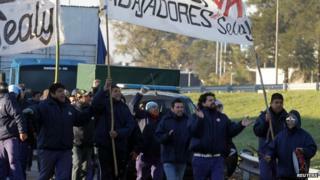 Three of the country's main unions joined the strike and Hugo Moyano, said he estimated 80% of workers had taken part. The government criticised the protest, saying it was "political in nature" and that only 25% of workers joined it. "There are trade unionists who are in opposition [to the government], and that's fine, but they should respect the citizens and leave their protest for 2015" when presidential elections will be held, Cabinet Chief Jorge Capitanich said. The trade union movement in Argentina is divided into those who back the government of President Fernandez de Kirchner and those who think it is not doing enough to help workers. The industrial action comes amid increasing economic problems for Argentina's government. Unemployment rose to 7.5% in the second quarter as consumer spending and industrial output both fell. The government has not issued any inflation figures since February, but according to Buenos Aires based research firm Elypsis, consumer prices rose by 38% from August 2013 to August 2014. Growth is expected to be hampered further by the fact that Argentina is in a technical default after a New York court blocked interest payments to bondholders last month.